An interesting first season for Super League’s newest side, which started off with lowered expectations which it’s debatable were even reached. Some good things happened for the Crusaders this year. A lot of bad things also happened. Unfortunately, the bad things really started to pile up towards the end of the season, finally reaching the point where one found it hard to call the Crusaders’ inaugural Super League season a success, even by their relatively modified standards. In the end, off-field distractions (like having to switch stadiums next year, and that whole visa thing) undermined what could have been a fairly solid first Super League campaign. The Crusaders rarely looked like world beaters, but they didn’t look too out of place and a look at their Seasonogram shows that most of their early season defeats were in the twenty point range – hardly a collection of blowouts (Salford looked much worse at the start of the season). They even managed to win a few games, and in beating Wigan and Bradford they took a few big scalps. This was a game that turned out to be fairly intriguing, although in a fairly passive kind of way. The main problem was that by the time it had become an even contest Huddersfield already had an insurmountable lead. Credit to the Crusaders for not giving in an folding completely, but they should be worried by a very poor first half and a lacklustre defensive effort. The Giants showed much attacking threat, but as Brain Carney alluded to in the commentary, the one thing they really seem to be lacking is a ruthless streak. With the start that they had, they could have quite easily pulled out to a fifty or sixty point win. As it was, they settled for a twenty-four point victory, and although that’s none too shabby you would have to feel that they might consider their second half performance a little disappointing. Nonetheless, they have accumulated a more than adequate number of crafty midfield types (Shaun Lunt the latest to really emerge) and with a talented backline and a dynamic pack, they are looking like potential contenders. Once they develop consistency and a killer instinct, they will be right up there. There’s something about these comments which just strikes me as very… mafioso. As well as being condescending it comes across almost like a threat, like how it would be a shame if anything happened to your wife and kids whilst you were at work. His comments seem to undermine the purpose of the Crusaders (to develop the strength of League in Wales) which seems remarkably pointless given that no-one thinks that League will overtake Union in Wales any time soon (or indeed ever). 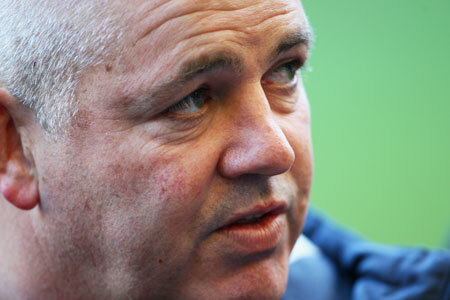 At the very least it comes across that Gatland wants to unzip flies and see who’s got the bigger one (metaphorically). It strikes me as a little reactionary and downright odd. Gatland is sort of right in that Welsh players are going to be more susceptible to a cross-code switch simply because Rugby Union is far more ingrained into the Welsh cultural psyche than it is for any of the other Home Nations. Whilst most English-born Leagues players probably never even gave a thought to the Union side when growing, it’s unlikely that many of the players coming through the Welsh system won’t have thought of putting on the red jersey of the Welsh Union side. But there are flaws in Gatland’s musings. Firstly, it should be fairly obvious by now that spending lots of money on Rugby League players is not a way to guarantee victory for a Rugby Union side (England got real lucky with Jason Robinson). Far too many League players in recent seasons have gone over to Union, tried it for a bit, seem that it wasn’t for them and come back to League in a worse position than when they left. Secondly, this plan relies on the Welsh regions being awash with cash, but they’re clearly not. In fact, that’s the reason the Celtic Crusaders were founded in the first place: because the WRU couldn’t afford to keep Leighton Samuel’s region going, so he defected codes. Now granted the sponsorship opportunities would almost certainly be higher in Union, but I really don’t think that blowing money on risky propositions is a clever thing to be doing in these financially precarious times. To be honest this is probably a moot point for a few years anyway, because it’s going to take a while for the Crusaders’ development work to take effect. Celtic Crusaders: Are new boys prepared for the unknown? Let the great experiment begin! I must admit, I was a little bit surprised that Celtic Crusaders were admitted into Super League with the first round of licences, but clearly the RFL have decided that now is the right time to bring in a Welsh team. Now they’ve been given the opportunity to compete with the big boys, it is up to them to show that they are up to the task and that they can increase the profile of Rugby League in Wales. The preparation of the Crusaders side has been haphazard to say the least. Admittedly they couldn’t have forecast that Quins would have to call off their friendly, but only arranging a single friendly before the season (in the period with the worst waeather and worst pitch conditions) does seem a little risky. Add to that the fact that some of their Australian players have only just been granted their visas and it’s hard not to think that this side will begin the season a tad undercooked. Of course, being an expansion team means that the Crusaders are going to have to deal with a different set of pressures beyond simple on-field performance levels. First of all, they will be under constant scrutiny for their attendances. I’ve no idea what to expect for this, but I would guess that anything over 5,000 as an average this season would be a pleasant surprise. Secondly, they will need to be shown making advancements for the development of the game in Wales, which means that there will be pressure to bring through quality locals into the side. Given that it took Harlequins 25 years to produce Super League level talent (admittedly they didn’t even really try for the first 15 years or so) I would say that having one or two Welshmen as regular squad members should be seen as successful first steps. In case you haven’t guessed, I’m really not sure what to make of the Crusaders this year, or what realistic expectations are for them. I would guess that scraping into the playoffs should be the pinnacle of their aspirations, but I expect them to be spending most of the first season around the bottom of the table. I also fear them making a terrible start, which could prove terrible and kill any potential momentum. I think, like Catalans on their entry to Super League, they’ll just be happy to even be in Super League this season, use it to assess where they are, and start worrying about becoming challengers next season. You are currently browsing the archives for the Celtic Crusaders category.